Jack Luebbe fires a shot on goal for the Blue Lions, defended by Brandon Goddard (4) of McClain during an SCOL match Thursday, Sept. 8, 2016 at Washington High School. 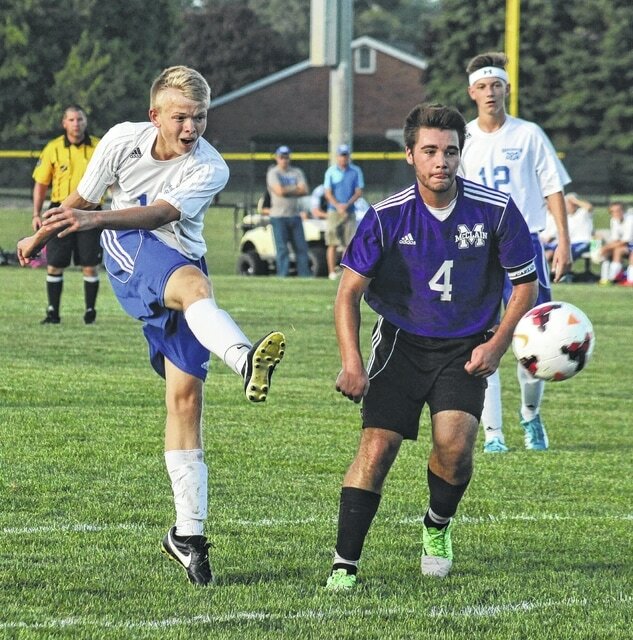 The Washington Blue Lion boys soccer team hosted the McClain Tigers for an SCOL match Thursday, Sept. 8. Washington won the match, 3-0. The Blue Lions improved to 3-2 in the SCOL, 4-2 overall with the victory. Washington held a 3-0 lead at the end of the first 40 minutes of play. The Blue Lions scored midway through the first half. That turned out to be all the scoring Washington would need on this evening. That goal came with two minutes to play in the first half. Finally, the scoring ended when Hanusik converted a penalty kick with one minute left in the first half. “McClain had possession in the second half a lot more than in the first,” Teter said. “Our defense took care of everything in the first half. Washington had 10 shots in the match. The Blue Lions play at Miami Trace Tuesday at 5 p.m.
Miami Trace played to a 0-0 tie against Clinton-Massie Thursday, Sept. 8. Washington has scored 13 goals (3rd in SCOL) through five SCOL games and Miami Trace’s defense has only allowed six goals (3rd in the SCOL) in four SCOL games. Washington is 4-2-0 overall with 20 goals scored and 12 allowed. Miami Trace is 3-2-1 overall with 12 goals scored and 10 allowed. Wilmington leads the SCOL with a record of 5-0-0. Chillicothe is undefeated at 4-0-0. Washington is third in the league at 3-2-0. Miami Trace is fourth at 1-2-1, followed by Massie with a record of 1-4-1, McClain, 1-4-0 and Hillsboro at 0-3-0. East Clinton does not have a soccer program. On Tuesday, Sept. 6, Washington visisted Wilmington and lost to the Hurricane, 5-1. Nate Horton scored on a corner kick for the Blue Lions that made the score 3-1 at the half. “I thought we did a good job,” Teter said. “But, they’re an excellent dribbling, passing team. On their turf field and with Sam Spirk (Wilmington’s stand-out striker) it’s quite a challenge. They’re a strong team. The top teams in the league, Wilmington and Chillicothe, play for the first time this season on Tuesday. The Cavaliers have yet to be scored on this season, Teter noted.